Where has the Climate Ribbon been lately? At the culmination of the People’s Climate March on Sunday, September 21, crowds of marchers gathered around a Tree of Life sculpture decked with thousands of multi-colored ribbons. Many of the marchers had carried their ribbons through the streets of Manhattan; some had brought them from their hometowns thousands of miles away. Each ribbon was inscribed with a personal response to the question: “What do you love and hope to never lose to climate chaos.” After tying their ribbon to the Tree, marchers read through the other ribbons on the Tree, chose one that particularly moved them, and tied it onto their wrist. This ribbon exchange was very 21st century: global in scope and focused on a burning contemporary issue, yet it has roots in both ancient and local traditions. It was explicitly inspired by Northeastern Native American quahog and whelk shell wampum belts, which signify the mutual exchange of trust when commitments are made between people. Moreover, the custom of tying ribbons to a tree in order to ask for wishes, hopes, and healing, has resonance in cultures around the world. The Lakota people, for example, use prayer ties (tobacco or cornmeal wrapped in cloth) as an offering, tying them to trees and leaving them in sacred places. The intentions and prayers then act as a blessing for all who come in contact with the prayer ties. The Cherokee people also make prayer ties, tying them to trees and sometimes wearing them. Similarly, Climate Ribbon participants wore the ribbons they had created, in token of their commitment to one another. In Ireland, fairy trees (or wishing trees, rag trees, or May bushes) are hawthorn trees to which people tie ribbons or strips of colored cloth to ask for blessings from local spirits or saints. These trees are commonly located at sacred wells. The ribbons or cloths are called “clotties,” and are often used to ask for healing: when the rag wears away, the illness will be gone. At “clootie wells” in Scotland, the rag is dipped in the water of the holy well and then tied to a branch while a prayer is said to the well’s saint or spirit. 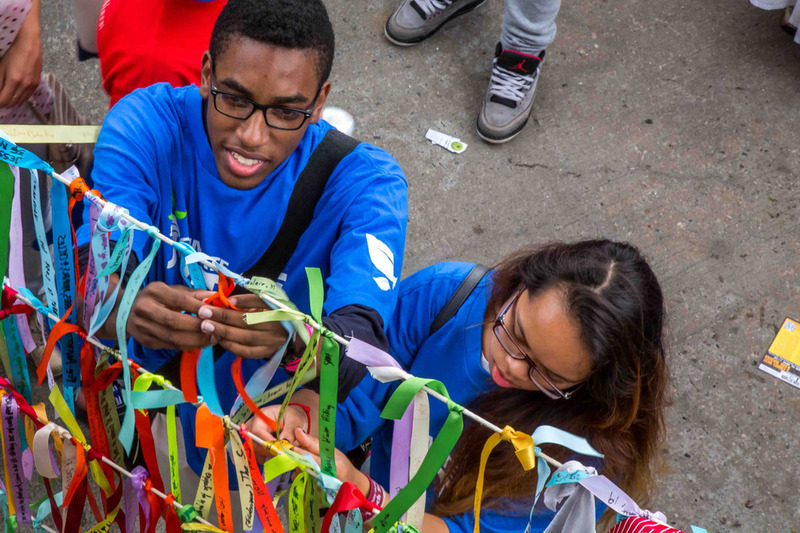 The climate ribbons on the streets of New York, also contained peoples wishes, prayers, hopes and dreams. In Nepal, trees near sacred sites are hung with ribbons and string. In Thailand, sacred trees are wrapped with colorful strips of cloth to mark them as homes for spirits. Buddhist monks in Thailand have saved trees from being cut down by wrapping them in cloth, thereby making them sacred. In the spring, a “tree of life” is hung with white ribbons at the midpoint of spring. Similarly, in Europe, the maypole, used to celebrate the spring, also represents a stylized tree, and is adorned with brightly colored ribbons that represent new life coming to the world. In Brazil, on Mayday, a tree is designated the “tree of life” and is hung with ribbons and the white flag of the Yoruban god of time. Likewise, the “Tree of Life” at the close of the New York march also represents people’s hope for rejuvenation of the Earth. In India, worshippers pour water at the roots of the sacred pipal tree, and tie rags to its branches as offerings. The rag-offerings are particularly associated with weddings and with healing. Rags are also hung on trees that are regarded as shrines to the local deities. The banyan tree, sacred to many deities, is adorned with garlands of nuts and with the wedding dresses of brides. In China, there is a custom to tie rags on a pole in front of the shrines of village deities, to ask for healing. In Siberia, indigenous peoples tie cloth to trees as well to ask for healing, luck, or some other wish. In many Muslim countries, including Iraq, Lebanon, and Syria, pilgrims tie rags to trees outside the tombs of saints. They may also take and wear another rag from the same tree that has absorbed the holiness of the place. In Israel/Palestine, the custom is practiced by Muslims, Jews, and Druze. Graves of sheiks and saints often have a sacred tree with rags tied to it. In Sfat, at the tomb of sages such as Isaac Luria and Pinchas ben Yair, bags of written prayers are hung on trees near the tombs. The Climate Ribbon goes to Berlin! Attention! This is going to be really quiet! We’re happy to announce that our project has a solidarity project with fellow friends of the earth in Europe. The climate projection group Fossil Free Berlin - part of 350.org’s global Fossil Free campaign - are taking The Climate Ribbon to Berlin this month. The project is evolving with the Silent Climate Parade on September 12th: The ribbons will be handed out and signed before the parade, tied around our wrists while we’re dancing into the sunset. For a few hours, DJs will be playing tunes we’ll hear on our headphones…a silent crowd with signs, smiles and colorful ribbons…the craziest demonstration, a silent dance for the climate! Announcements of various groups will happen for a joint cause: To bring fossil energy era to an end and to worship this beautiful planet we live on. Towards the end of the parade, we will tie all ribbons to a string which will be wrapped around a pillar of the iconic Berlin Brandenburger Tor, as a colorful thread of solidarity for a healthy sustainable planet. If you are in Berlin, check it out….and the journey of The Climate Ribbon will go on after the SCP - and is “traveling” more this month, so stay tuned! The Climate Ribbon is preparing for Paris!! And we need you. Hello Ribboneers! :) Bonjour rubaniers! As many of you know, at the end of this year there will be a massive climate justice mobilization during the UN climate summit in Paris (November/December). The Climate Ribbon Project is excited to be working with some fantastic partners (Coalition Climat 21, Alternatiba, a community in Les Lilas, etc.) and to bring the tree and mass ritual to the mobilization (like in NYC last September)(but BIGGER!). We are currently workshopping some designs (above and below!) for different gatherings/spaces, and we would love to hear from you. 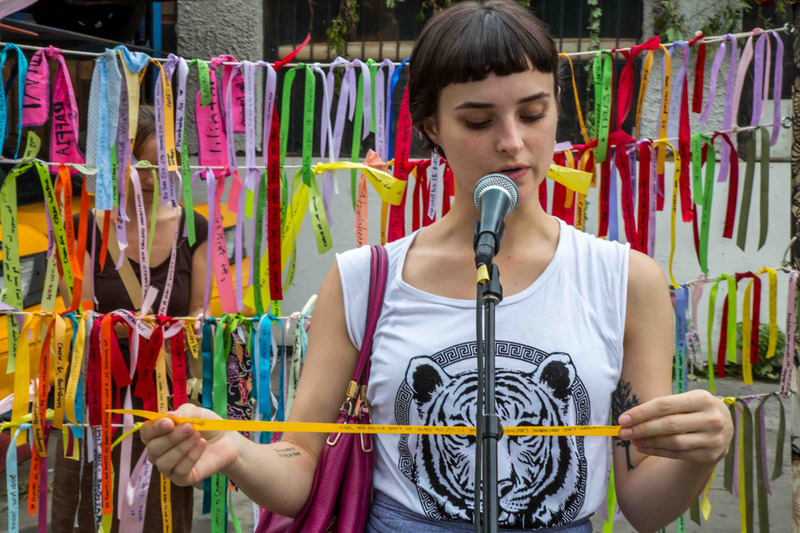 Please send any ideas you have (email to climateribbon(at)gmail(dot)com) and if you are interested in hosting a Ribbon ritual between now and November, we would love to take your Ribbons and Stories to Paris (DIY Toolkit here). Sunday, July 26, 2015, a Climate Ribbon Tree was created at Isabella Freedman Jewish Retreat Center in Falls Village, CT. The weekend of July 25-26 marked the Jewish holiday of Tisha b’Av, the day when Jews remember the destruction of the ancient temple in Jerusalem, a day for grief and mourning. It seemed fitting on this day to grieve the massive loss of life to climate chaos that is happening in our modern world daily. 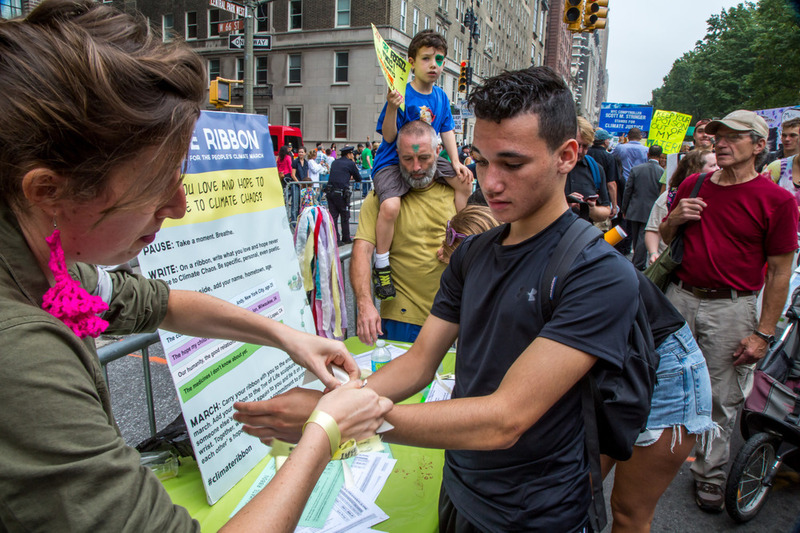 The ritual was led by Kohenet Hebrew Priestess Institute cofounder Rabbi Jill Hammer, and Climate Ribbon co-creator Rae Abileah, who guided people through writing on ribbons what they love and hope to never lose to climate change, or are already losing. While chanting, we walked meditatively into the forest and read our ribbons out loud to each other, pledging to support each other in protecting what we hold dear. We tied the ribbons to a young tree that will become a living memorial, and shared stories on the history of prayer trees from cultures around the world (read more about this in an article by Rabbi Jill Hammer at http://theclimateribbon.org/tree). Small kids and elders joined in the tying on of ribbons, and the little ones’ playful laughter mingled with the older ones tearful reflections … how do we hold all our emotions, as the world burns? The Climate Ribbon Tree will become a sacred site at Isabella Freedman, welcoming participation of all who visit and dwell there. The Adamah farming fellows who live at Isabella Freedman have already held a second ribbon ritual there, led by Simcha Schwartz, and so the project grows. Big hearted thanks to Adam Segulah Sher, Margot Siegle, Shamu Sadeh, and the rest of the staff at Isabella Freedman for supporting this art ritual to come to life, maintaining the sacred tree site, and teaching future retreatants and youth groups about the climate ribbon project and how to take action for climate justice. Two months after the historic Peoples’ Climate March, and days before the UN Climate Summit in Lima, Peru artists and activists came together for an evening of art & activism at Thoughtworks, as solidarity events began in NYC. A portion of The Climate Ribbon was installed in the gallery. Members of the Climate Ribbon Team, including Rae Abileah (above), updated the crowd on the People’s Climate Art and Climate Ribbon activities since the March and their plans for 2015 heading up to the streets of Paris in December, 2015, during the next UN Climate Summit. Ileia Burgos of Rockaway Wildfire lead the crowd through the ribbon ritual, where attendees were invited to write on a ribbon “what they love and hope never to lose to climate chaos” and then tie them to the structure. Finally, they were asked to choose one that was written by another and tie it around their wrist to take with them. The PCM & FWS gave birth to a flourishing art movement around Climate Justice, where art was central not only to public expression during the march, but central to the organizing strategy and action design. Photographs, screen prints, posters, sculpture, video and more were included in the multimedia exhibit. Climate Ribbon at Northern Arizona University! The Climate Ribbon ritual has been happening across the country since the People’s Climate March. Recently, students at Northern Arizona University (NAU) integrated the Climate Ribbon Project into several campaigns run by a student group, The Weatherization and Community Building Action Team (WACBAT). “As a part of WACBAT, I can speak to how we are using the Climate Ribbon Project to engage folks to reflect upon their stake in climate change and what they stand to lose to this crisis. Our group first integrated this project into a national day of action that was happening on November 14th, 15th, and 16th around putting a price tag on carbon and having polluters be held accountable for creating carbon based environmental degradation. This event was immensely successful and over 150 students participated in the Climate Ribbon Project over the three days, reflecting on how climate change would personally affect their lives and what they loved. Thanks Michaela- glad to see the Climate Ribbon in Arizona! Two months after the historic Peoples’ Climate March, and days before the UN Climate Summit in Lima, you are invited to gather in Manhattan for an evening of art & activism, as solidarity events begin in NYC. People’s Climate Arts & The Climate Ribbon Art Show - Opening Night! 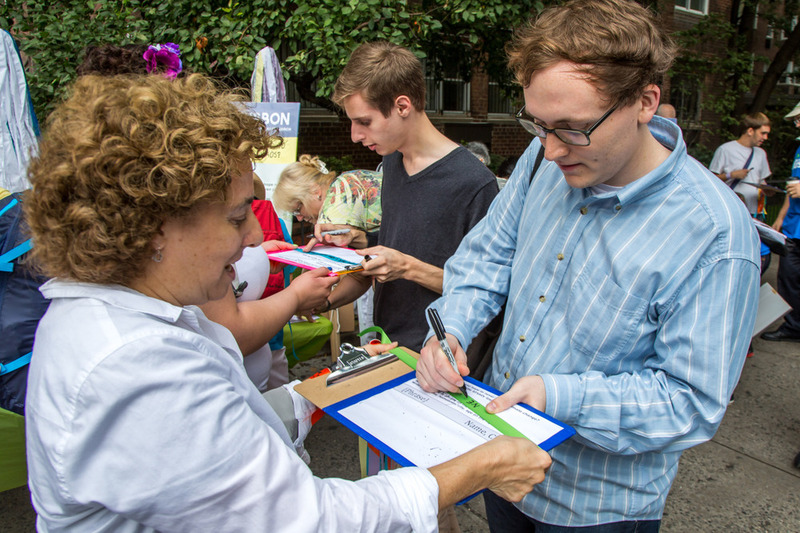 If you’d like to volunteer with the Climate Ribbon at any of these events, please email us. 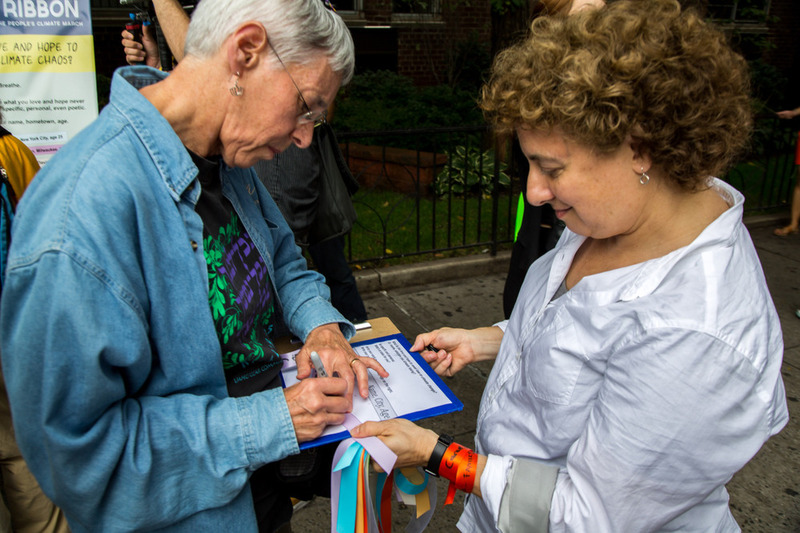 Ribbon-making tables at the People’s Climate March. Host your own ribbon table at a local event or in your congregation. 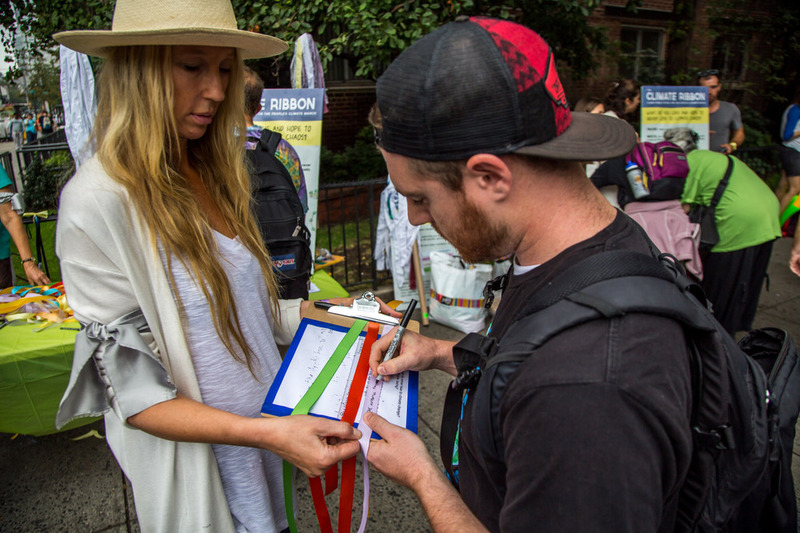 Reading Climate Ribbons at the People’s Climate March. Bill McKibben makes a Climate Ribbon at the People’s Climate March. 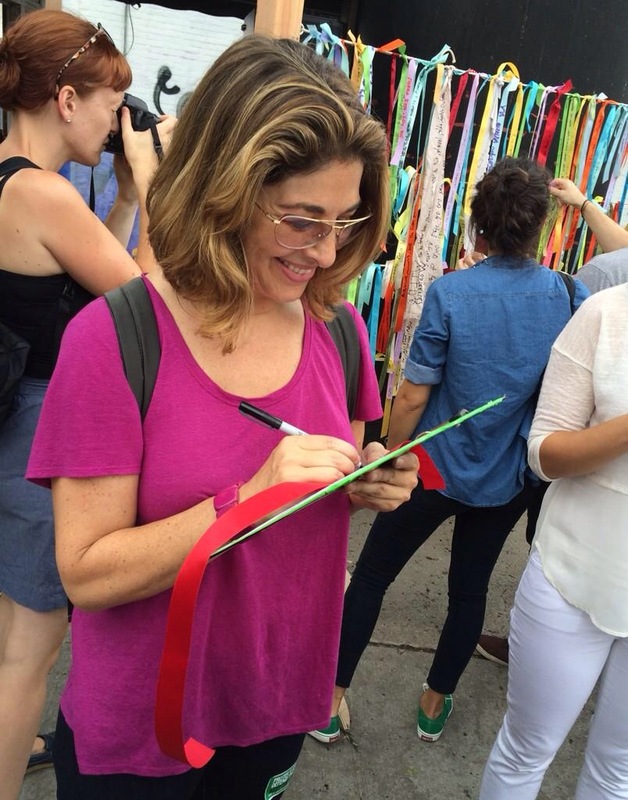 Naomi Klein makes a Climate Ribbon at the People’s Climate March. 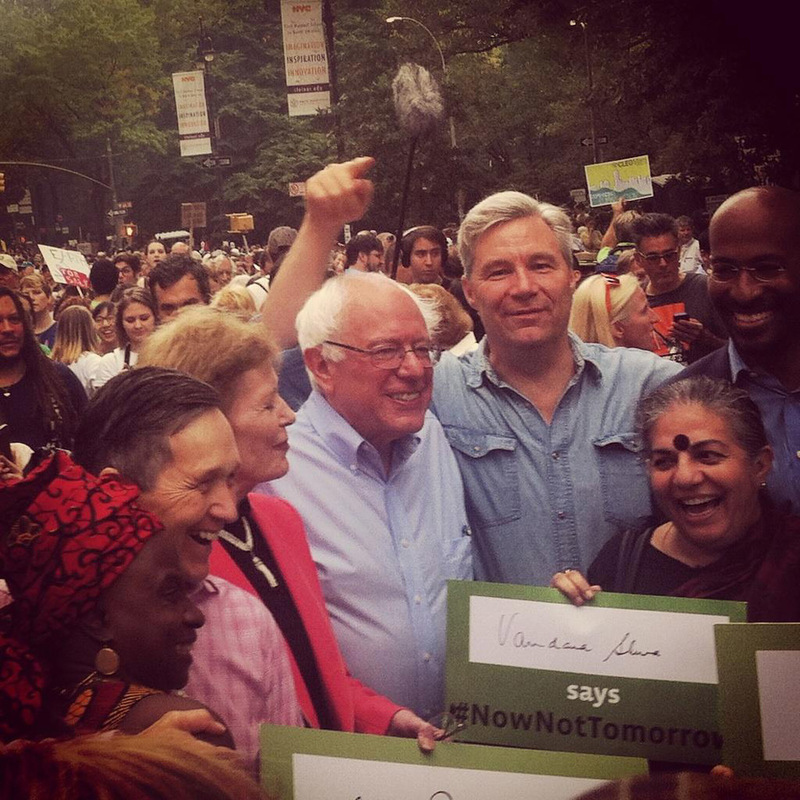 Climate Ribbon at the end of the People’s Climate March on September 21, 2014. Photos by Michael Premo.